Meeting at the Masonic Hall, Bath Road, Keynsham BS311SR 18.30 On the third Monday of April (installation), June, October and December. The Lodge has 30 subscribing members. The Installation of Ted Bevis into the Chair of Carnarvon Lodge was indeed a memorable occasion, not just for Ted! Tony Guthrie the IPM deputised for the Master, Barry McCormack who was away on holiday. Tony installed Ted in fine style, as Deputy PGM Phil Voisey commented, "you won't see a better installation ceremony". On taking the chair Ted invested his officers and a very happy festive board followed the proceedings. In the photo are l to r: Mark Golding - Deputy Grand DC, Bill Roberts - Lodge Junior Warden, Phil Voisey - Deputy PGM, Master- Ted Bevis, Mike Wake - Lodge Senior Warden and John Smith Grand Senior Deacon. It was good to see Masters from other Mark Lodges in attendance this evening, their suppourt much appreciated. 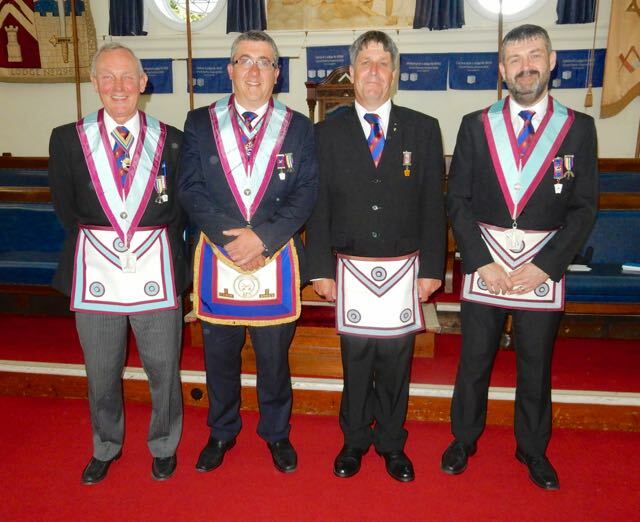 Left to right, David Maddern - Master Somerdale Lodge, Ted Bevis - Master of Carnarvon Lodge, Malcolm Ashford - Master of Hallam Mark Lodge and Patrick Haxell - Master of Portal Mark Lodge. After a successful two years in the Chair of Carnarvon, W.Bro Tony Guthrie installed his successor, Barry McCormack as Master of the Lodge in fine style. The ceremony was witnessed by the Deputy Provincial Grand Master, Philip Voisey who was accompanied by the Provincial Senior Grand Warden, Ian Anderson and Provincial DC Mark Golding. It was an excellent meeting with over forty Mark Master Masons present. In the photo from left to right - Mark Golding, Mike Wake (JW), Barry McCormack, Ted Bevis (SW) Phil Voisey and Ian Anderson. 15th June 2015. The summer meeting of Carnarvon Lodge is always well attended, in addition to our many visitors there is an annual fraternal visit from the Master and Brethren of the Baldwyn Lodge of MMM in Bristol. This year was no exception, over fifty were present to see Bro Paul Marshall advanced into the degree. The PGM John Morgan congratulated the Master, Tony Guthrie and his team for an excellent ceremony. 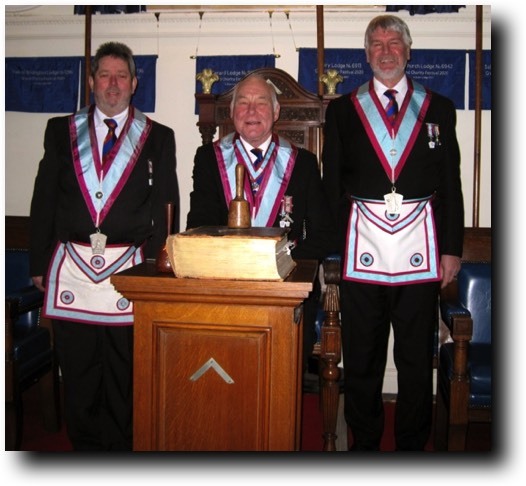 Photo: Barry McCormack - Senior Warden, Tony Guthrie - Master, Paul Marshall the new advance and Darren Dymond- Junior Warden. Installation Night, 17th April 2012. The Deputy PGM, Ray Guthrie and the Provincial Senior Warden, Tony Heliker were present along with forty other brethren to see W.Bro Eddie Cannon install Bro Graham Howell into the Chair of Carnarvon Lodge. It was a pleasant evening of Mark fellowship. The New Master is in the photo with Bill Parks the Senior Warden on the left and Paul Giblin the Junior Warden on the right. 21st June 2017 - Lodge raise £200 for Children's hospice South West. 29th November 2009 - Past DPGM Pat Parker celebrates 50 years in the Craft. 1st November 2009 - Past Master runs to help Prostate Cancer charity.